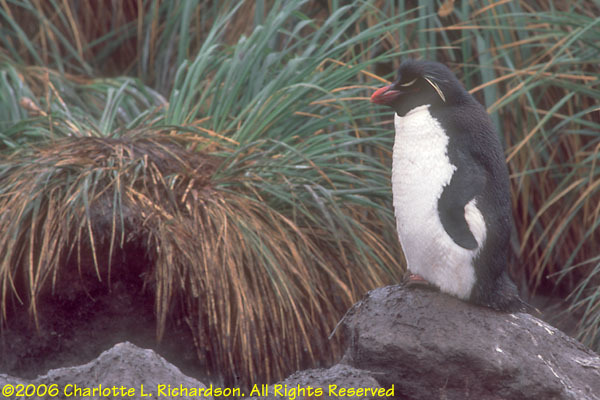 Penguins are emblematic of the Southern Ocean. 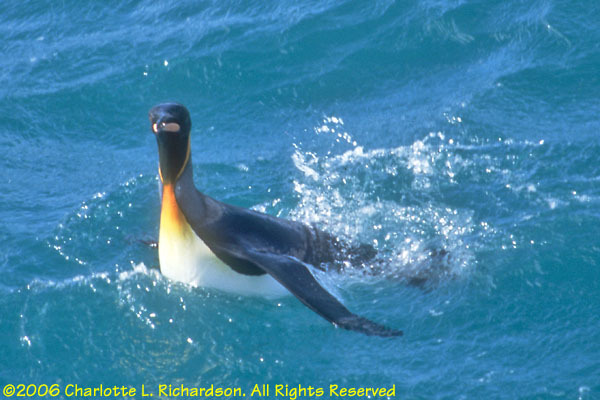 The most aquatic sea birds, their outer feathers are like scales and are almost impermeable to wind and water. 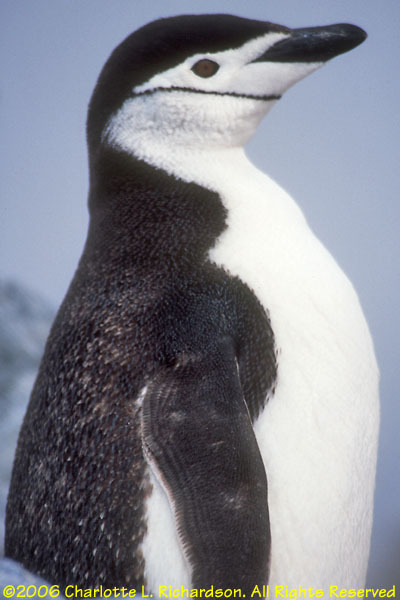 Blubber makes up about a third of the weight of most penguins and provides both insulation and food reserves. 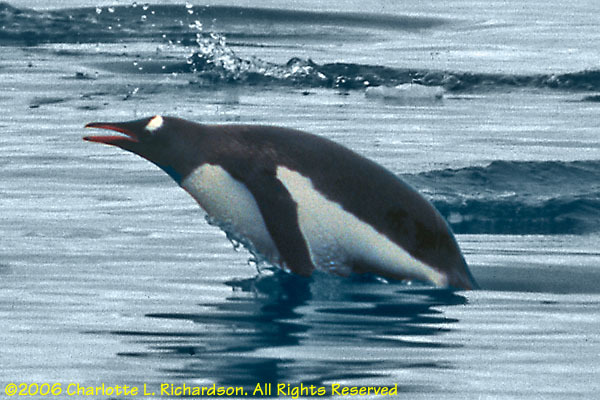 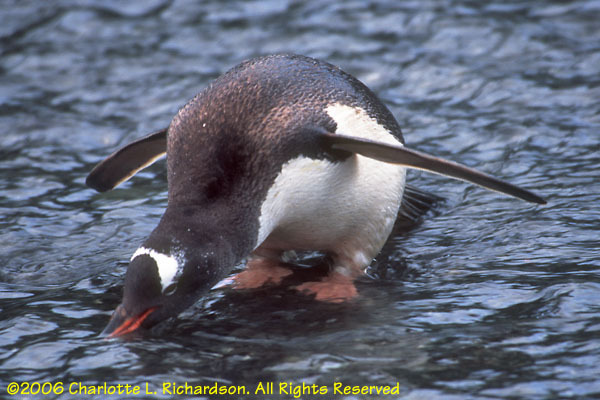 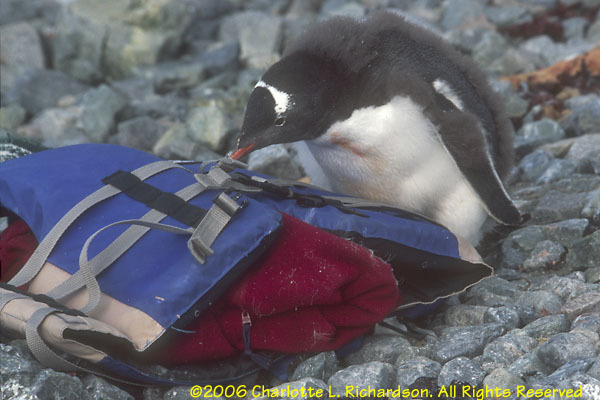 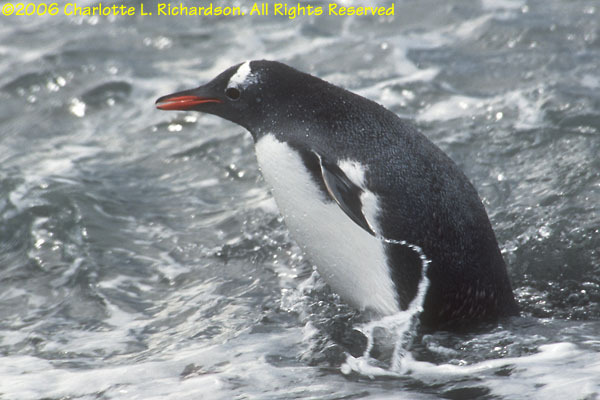 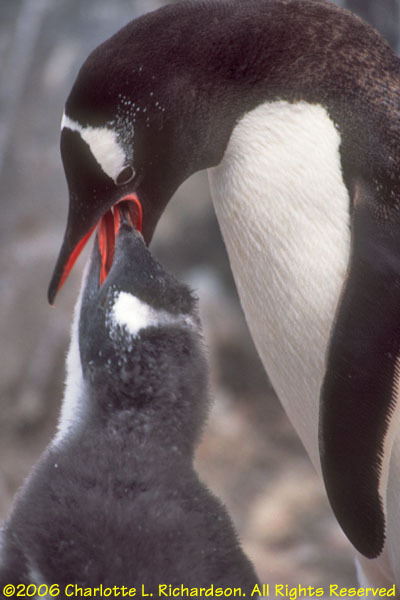 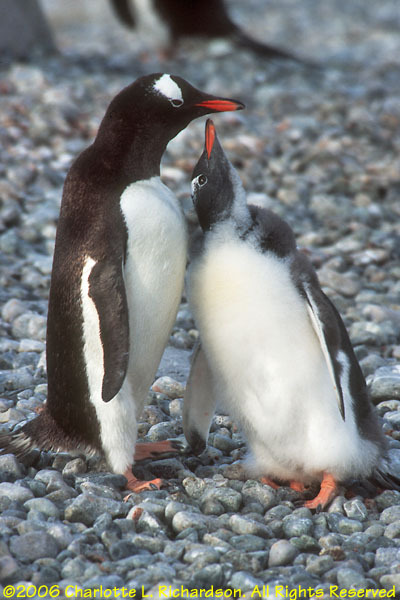 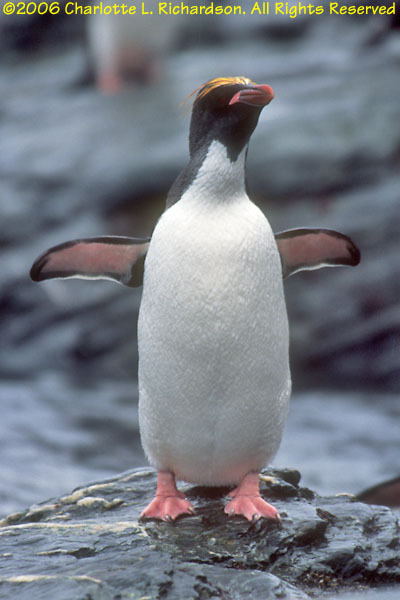 Smaller penguins eat krill (shrimplike crustaceans) almost exclusively, while larger ones also eat fish and squid. 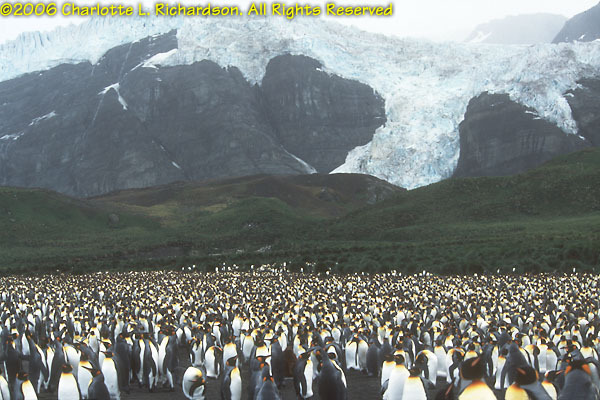 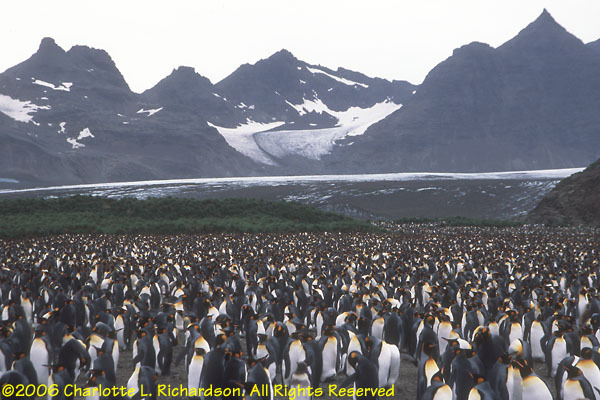 Most penguins nest in large colonies. 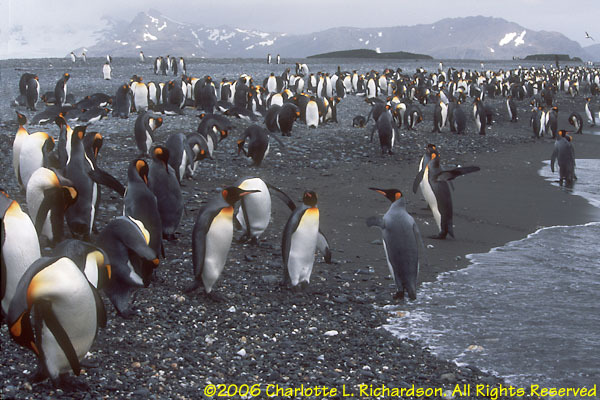 Of the 17 species of penguins, we were able to photograph seven on this trip. 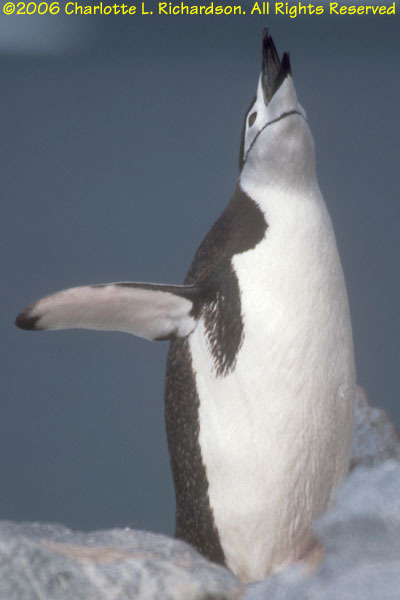 The most common ones were the brush-tailed (Pygoscelis) species: Adélies, gentoos, and chinstrips. 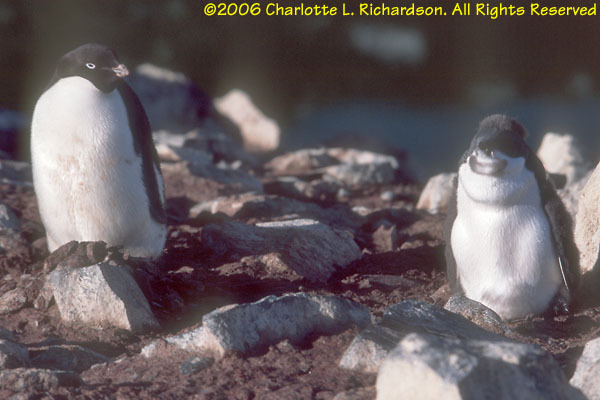 The crested (Endyptes) species include the macaronis and rockhoppers. 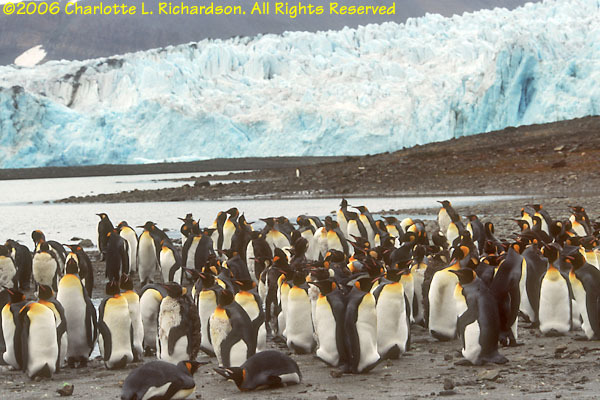 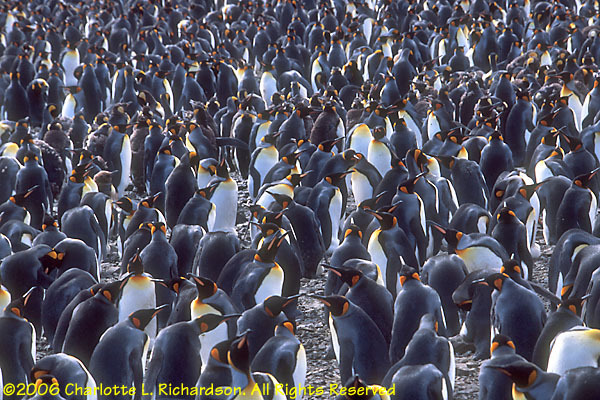 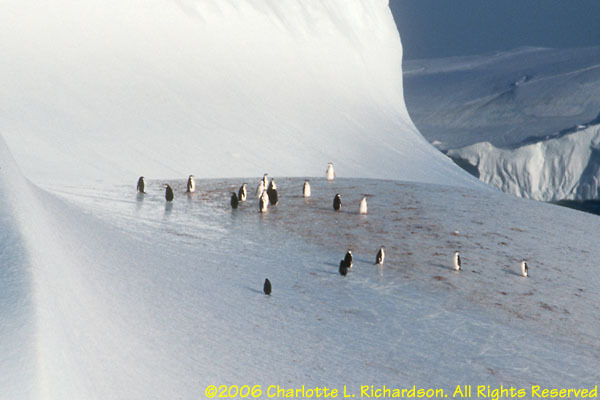 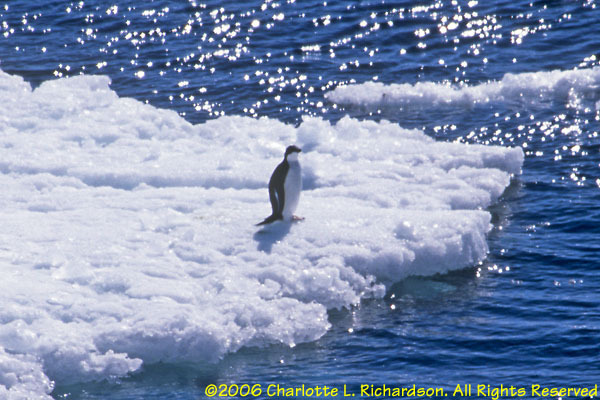 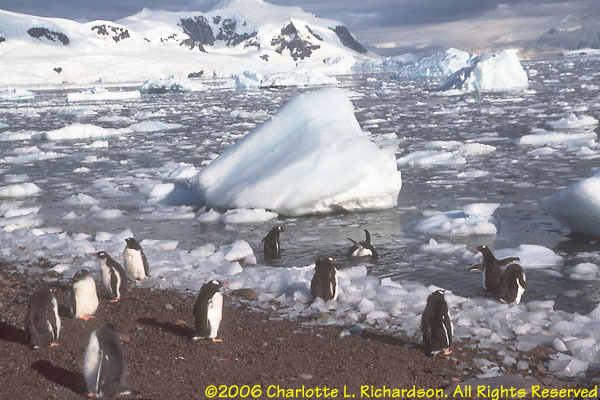 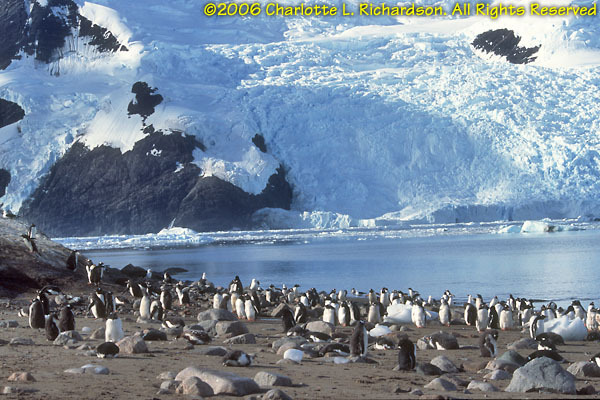 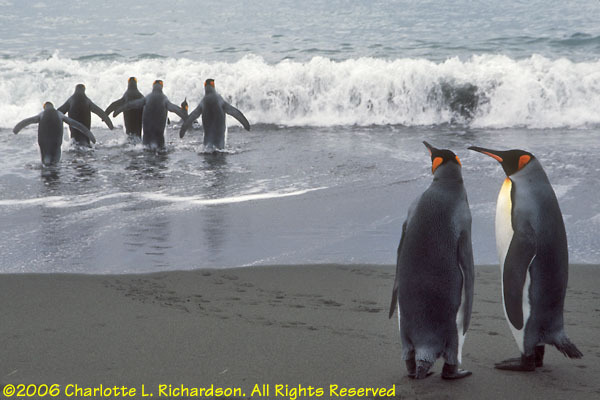 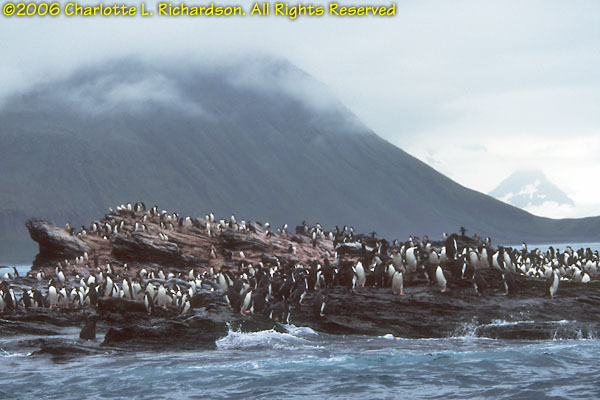 The Aptenodytes include the king pengions and the emperor penguins, which we did not see on this expedition. 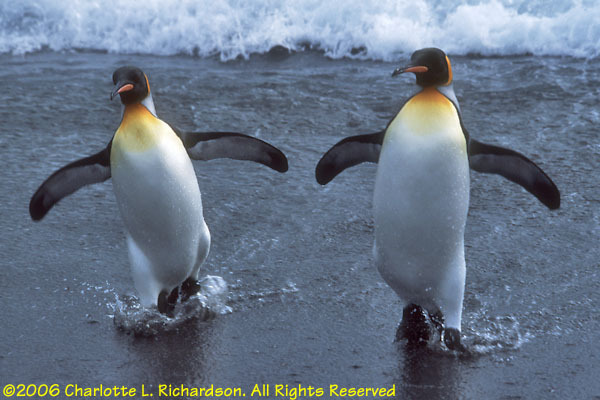 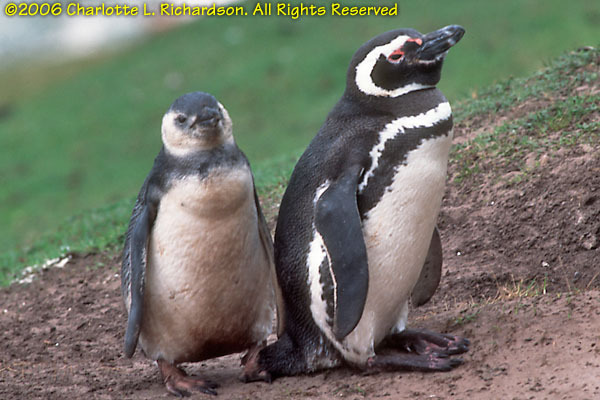 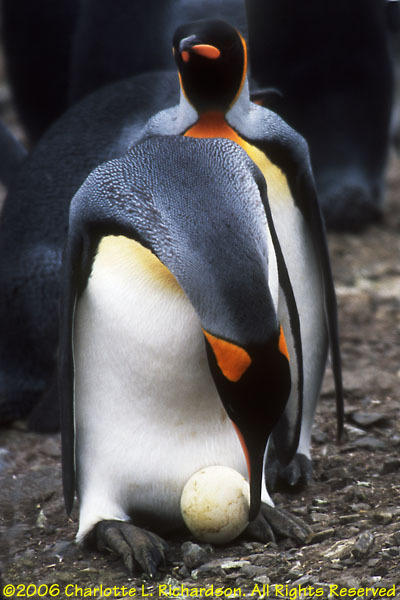 These penguins are found in the Falklands and the southern tip of Patagonia. 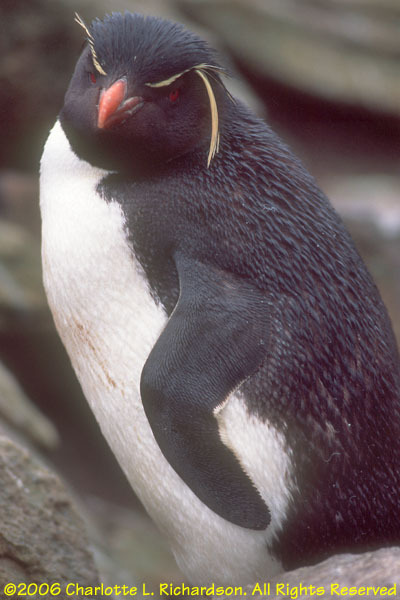 Rockhoppers are the smallest of the crested penguins. 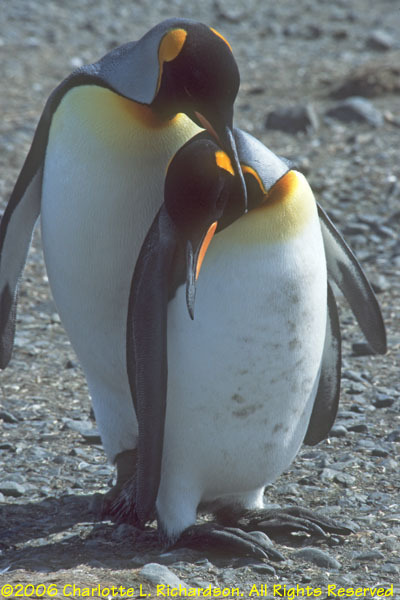 They are black and white with a thin yellow stripe that runs from the back of the eye towards the back of the head. 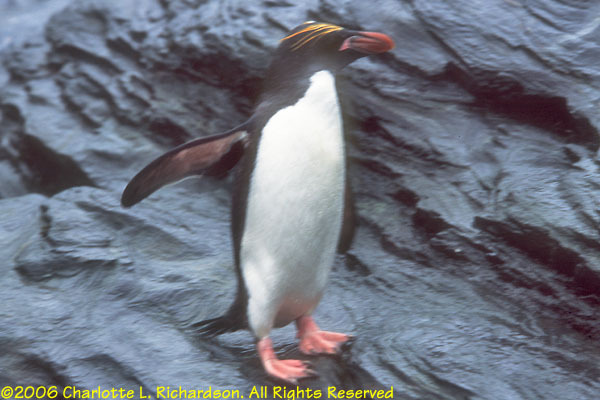 These yellow tassels are similar to macaroni penguins but do not meet between the eyes. 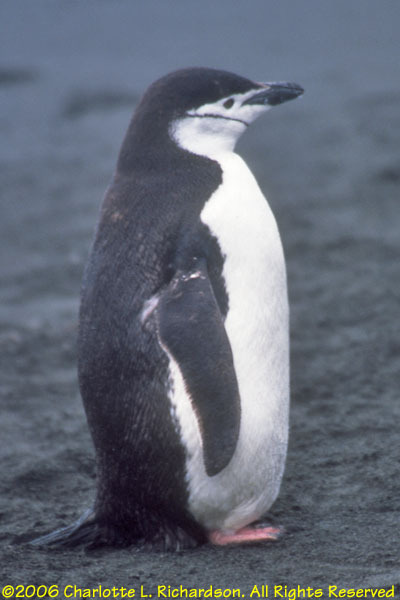 Chinstraps have a distinctive thin black line connecting the black cap on their heads to below their chins. 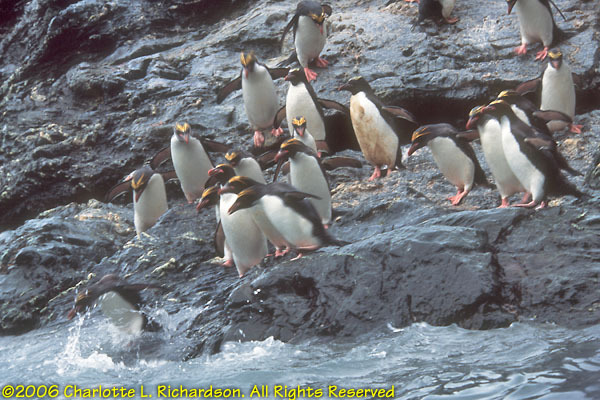 They produce loud, shrill calls and loud shrieks. 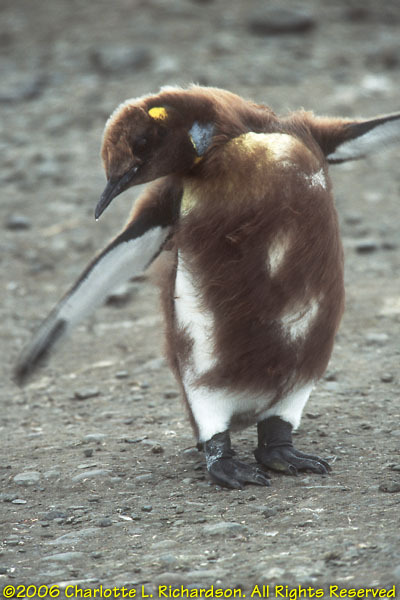 Chicks have grey backs and white fronts. 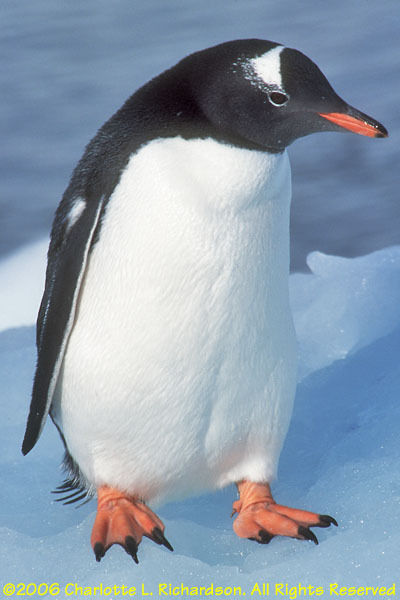 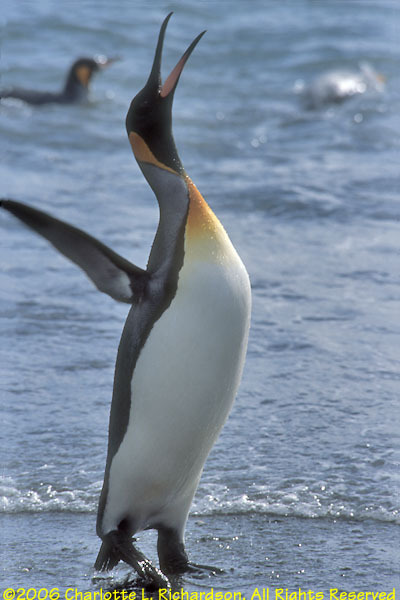 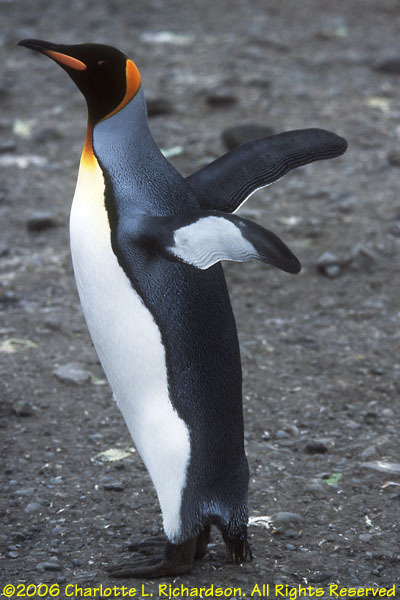 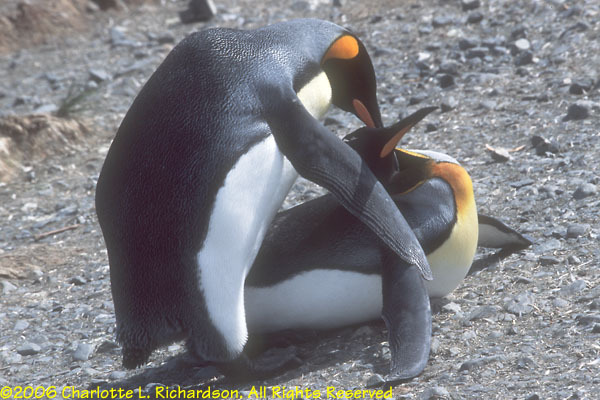 Second largest of the penguins, kings have an orange-yellow patch on their chests and greyish-black backs. 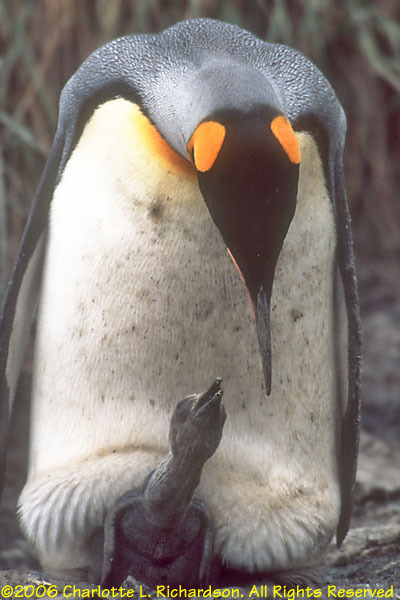 They have a closed yellow-orange teardrop from behind each ear to the base of the head. 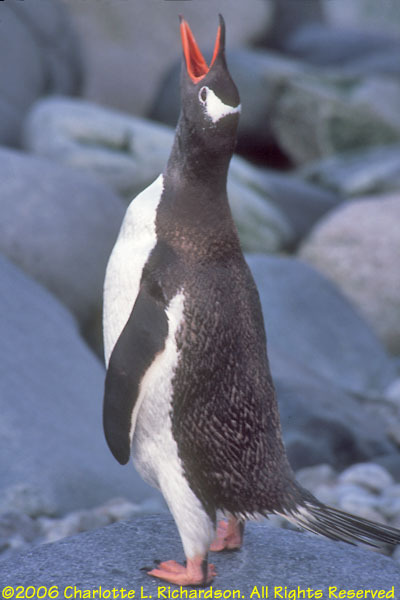 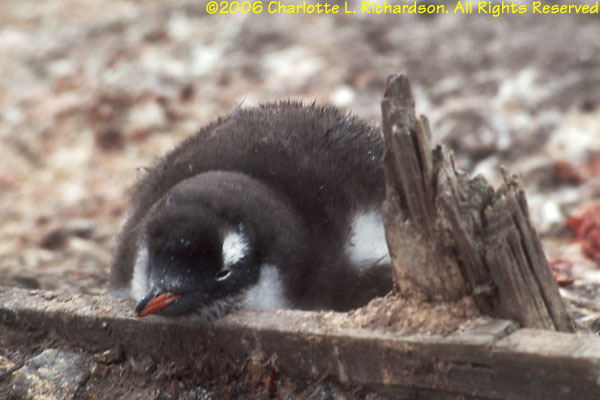 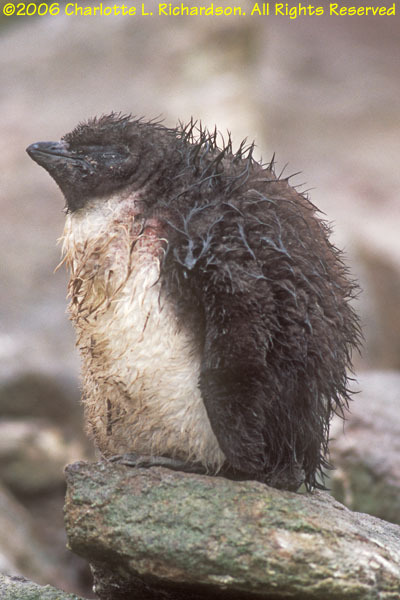 The downy chicks are dark brown, and were once described as a separate species, the "woolly penguin". 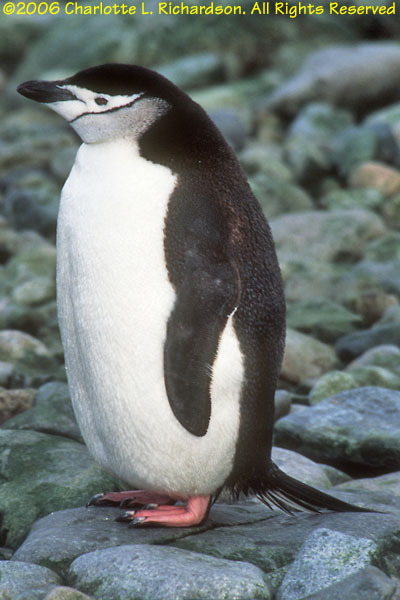 They are found only north of the Antarctic continent. 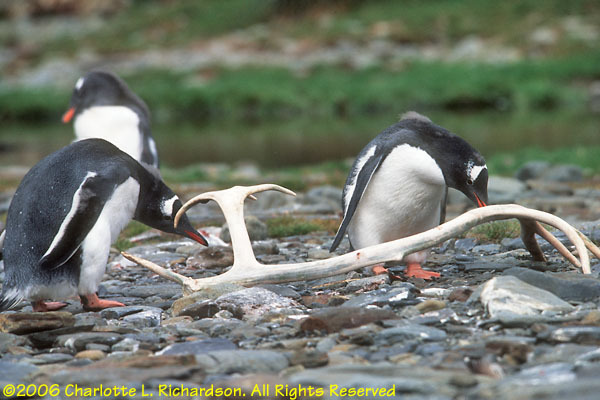 Kings eat mostly fish. 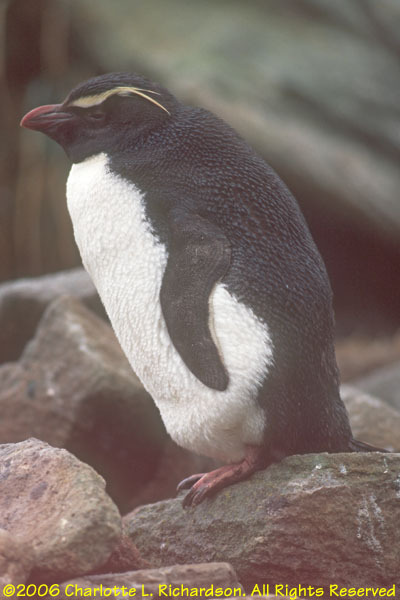 Black and white with a white bonnet on their heads, gentoos have orange bills. 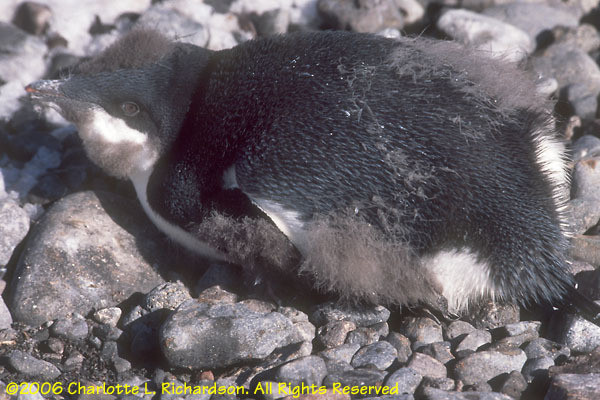 Chicks have grey backs and white fronts. 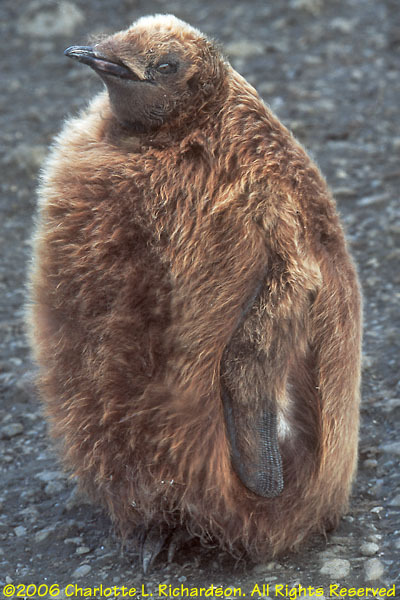 Gentoos are curious and bold. 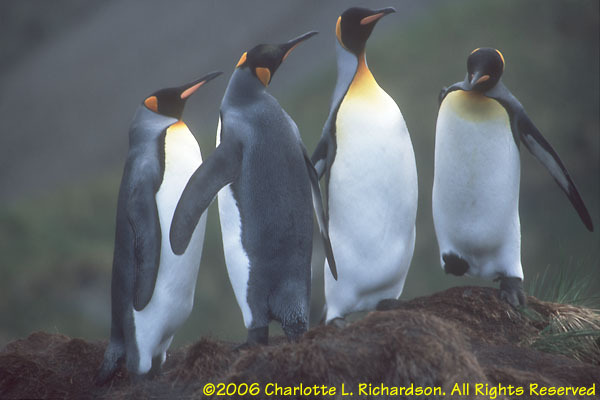 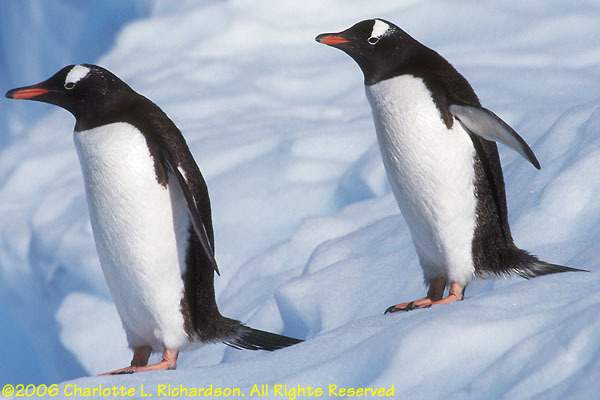 These crested penguins have orange, yellow, and black crests that join on the top of their heads, and have black chins. 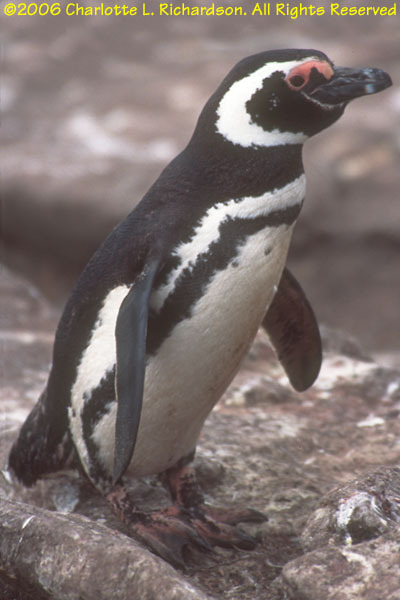 Named for the wife of French explorer Dumont d'Urville, they have a white front, black back, and a white ring around their eyes during their breeding season. 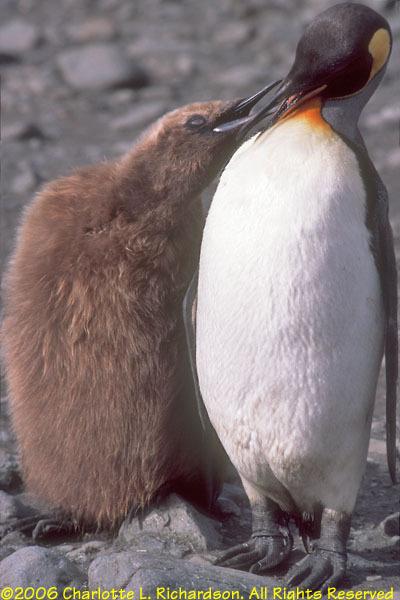 The chicks are downy brown with a white chin. 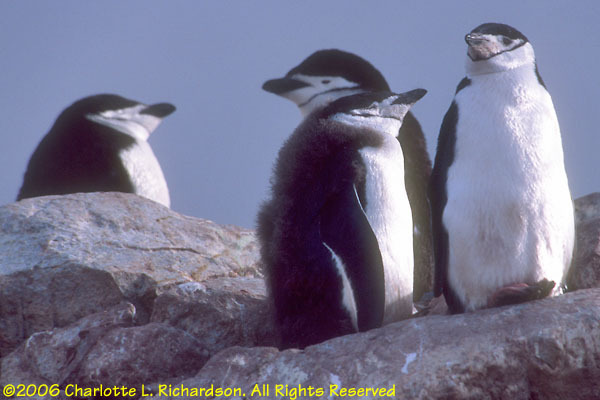 They breed early and were almost completely absent from their colonies in February when we visited.